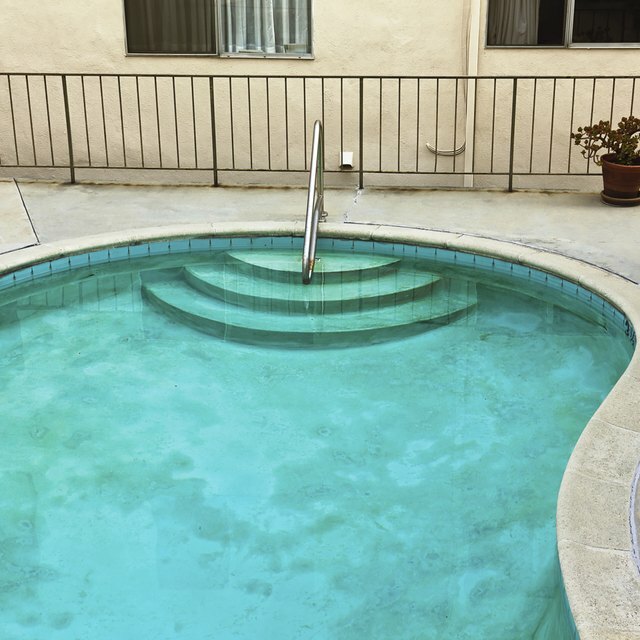 Careful chemical disinfection keeps pool water clear and healthy. Swimming pool water needs disinfection and constant maintenance in order to keep it safe for swimmers. Chemical treatment kills potential pathogens and neutralizes various contaminants that get into pool water from the environment or from swimmers who enter the pool. Although sanitation helps avoid serious outbreaks of disease, the treatment itself causes reaction in some swimmers. Bromine sometimes causes skin irritation in sensitive pool users. Bromine is an element that is a member of the Halogen family. Found in naturally occurring sea salt compounds and brine, bromine comes from ocean waters and coastal areas around the world. It is similar to chlorine, and pool maintenance workers and managers use it along with chlorine to disinfect and maintain swimming pools. Like chlorine, it is highly reactive. In water, bromine readily interacts with various contaminants, such as ammonia from urine or the sweat or bacteria introduced by bathers. Bromine either breaks down and kills bacteria and some viruses or combines with substances to neutralize health threats. Bromine functions to help keep pool waters clear and safe. Maintenance workers or pool owners use bromine compound solutions or tablets, which when released in the pool form the disinfection agents used to cleanse and sanitize the water. When bromine combines with the nitrogen from urine, it produces byproducts called bromamines. Unlike chlorine byproducts or chloramines, bromamines do not cause eye irritation or skin irritation or have unpleasant odors, according to the South Australian Health Commission and Lentech Water Treatment Solutions. Pool workers or lifeguards might come in constant contact with bromine in a liquid or tablet form. According to the Centers for Disease Control and Prevention, splashing bromine liquid directly on the skin causes chemical burns and damage. Quickly washing off any bromine that gets on skin with soap and water helps minimize skin irritation. Most swimmers do not come in contact with undiluted bromine compounds, but some swimmers experience reddened and irritated skin in bromine-treated pool water. Skin rashes from contact or allergic dermatitis feature itchy, dry red patches or bumpy blistered skin, according to the Mayo Clinic. When contaminant levels in the pool rise, irritating bromine byproducts cause skin rashes and irritation. According to Mary Pohlmann, assistant professor of clinical medicine at Southern Illinois University School of Medicine and a member of the U.S. Masters Swimming Sports Medicine Committee, some people are more sensitive to bromine disinfection than chlorine disinfection. Pool managers often use bromine in spas and hot tubs because it does not break down in hot water. The heated water combined with the bromine compounds sometimes cause reddened and inflamed skin. Bromine is more stable than chlorine, so washing it off is not as easy as washing off chlorine, explains Mary Pohlman. Changing badly ventilated or maintained pools for better ones might help people who get skin irritations at a particular pool. Unfortunately, the only other way to deal with a bromine-related dermatitis is to avoid pools or spas treated with the chemical. Pohlman advises that infections might cause irritated skin as well as bromine, so check with a physician for any persistent problems. Environmental Science and Technology: The Good, the Bad, and the Volatile: Can We Have Both Healthy Pools and Healthy People? Why Does the Hair Fall Off of Your Limbs if You Swim Too Much?